Hi! I'm Frankie so I decided to be a baby for Halloween. & I couldn't just be any baby so I said I'll be a Frank-in Baby! I got the idea online and seen how a few others made their costume so I got to work. I got a cardboard box, cut the sides to form a bassinet leaving it a little longer on the part I knew I would form as a canopy. I also left an opening in the bottom so I could fit my head. I place these bendy wires around the higher part of the box, securing them with strong duct-like tape to use as a canopy once so I could place a blanket or ruffle on it. After the "base" was complete I hot glued pink sheet that got from the thrift store (I got everything from the thrift store to complete my costume!) to the inside lining of the box. Once that was completed, I cut up a white, ruffled bed skirt (which worked so perfect!) and glued it to the outside box and used part for the canopy. I used a thicker blanket for the inside padding to fit a baby body and glued a receiving blanket on top of it. Now here comes the funny part. I could not for the life of me find a used baby doll anywhere. I didn't want to purchase it new because all I needed was the plastic arms and hands. Finally I just used a stuffed animal to fill the baby body in a baby pajama. I still needed arms though. I went to the Dollar store and found this small baby doll with a soft body but hard arms and hands. I also needed a doll to match my darker skin tone so I said she will have to do. I came home and cut off her arms! (I know, terrible!) I then glued her arms to the sleeve openings of the pjs. Once she was all stuffed, I glued the body down to the bedding. I also had to cut a slit at the bottom of the bedding so I could fit my head. That was real tricky. But after practicing going in/out a few times the slit got wider. I did have to glue shut where I ripped the material though so no stuffing would fall out. 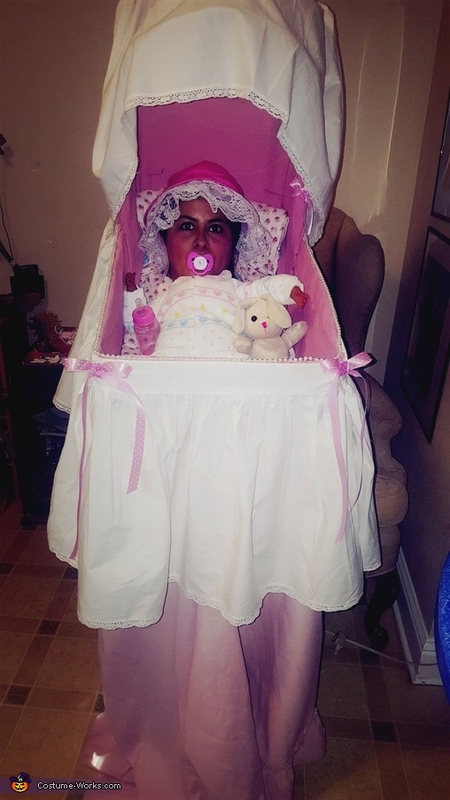 I also added a few details to make the bassinet look more real by adding ribbons on the corners and lace on the inner wires of the canopy so you couldn't see them. I also made my baby bonnet with a pink sun cap from the thrift store where the bill was made a lot bigger. I then found some lace that I glued all around it to give it more that baby effect. I also glued ribbon to it to tie around my neck. After, my boyfriend helped me make holes at the bottom of the box and stick wire through one of the hard arms of the baby from underneath. We had to glue it once the wire went through the arm. We did the same for the legs but used a wire hanger to control the feet with one handle. All this sounds a lot more complicated than it really was. I had the best time wearing this costume! People's reactions were priceless! My 30 year old brother also wore it and we put him in a shopping cart in a grocery store! That was a show stopper!! I was crying from laughing so hard!